As soon as Felicity Smoak gave Oliver the book at the end of last week’s “Vertigo,” Arrow put itself on the clock. A confrontation between Oliver and his mother was now inevitable, and the only question was how long the show would spin its wheels until the big confrontation. To the show’s credit, it only takes the span of one episode to bring the Hood crashing into Moira’s office, growling through his voice modulator that she has failed Starling City. It’s an incredible ending, and this is precisely the kind of strong choice I was talking about last week, although of course we still need to see the follow through, which had better be coming in a big way next week. But until then, tonight’s episode paves a largely effective path towards that big final confrontation. “Betrayal” doesn’t get everything right, but it gets a lot of mileage out of its titular theme, as multiple characters betray the trust of those they supposedly care about. And while two bonds emerge relatively unscathed, another two relationships appear to be fundamentally damaged. Arrow initially seems poised to back out of last week’s big reveal, as Oliver’s first confrontation with his mother ends with the book being thrown in the fire. Oliver is uncharacteristically credulous when it comes to his mother’s excuses, but then, this is his mother, and the show has previously established—not all that elegantly, but it’s been established—that Oliver thinks of his mother as a saint. Diggle isn’t nearly so convinced, and he urges Oliver to dig deeper. For one worrying moment, it seems as though that’s all Diggle is going to do, content to hang around in the Arrow Cave being an annoying voice in Oliver’s ear. But it’s soon revealed that Diggle has taken over as Moira’s driver, and he’s pursuing his own investigations. Minus an initial bit of comic relief in which Diggle suspiciously barges into a birthday party, this subplot is an excellent reminder that Diggle is a competent detective in his own right, as he gets all the evidence needed to convict Moira in her son’s eyes while managing to evade the suspicions of Malcolm Merlyn’s security guy. He defies Oliver’s wishes, but then, Diggle is Oliver’s partner, not his sidekick. He breaks the news to Oliver as gently as he can, but he doesn’t leave Oliver any room for ambiguity. Oliver has been betrayed by someone close to him, and he must decide whether it’s his mother or Diggle who is misleading him. The final scene offers an emphatic statement about just how much Oliver trusts his partner. While Diggle is busy moving along the show’s overarching narrative, Oliver deals with the Lances and recently released master criminal Cyrus Vanch. This plot is bookended by some real silliness that undermines a largely effective story. The first problem is that Laurel is forced to enlist the Hood’s help because the police can’t touch Vanch unless there’s evidence that he’s committing crimes again. That’s all well and good, but “Betrayal” establishes Vanch’s villainy by having him kill his lawyer in cold blood and take up residence in his mansion, which sure seems like it would be suspicious enough to instigate a new police investigation, one that might even be headed up by Laurel’s father the homicide detective. The show generally sidesteps such holes in logic, but this is a big one. And, in the Hood’s big assault on Vanch’s headquarters, there is some slightly cheesy fun to be had in the intercutting between Vanch detailing all his brilliant precautions and the Hood utterly devastating his defenses, but it all fizzles out once Oliver makes it inside the house. The direction for the fight sequences generally feels a bit slack in this episode, and Detective Lance’s sudden appearance feels less a triumphant reveal than it does a bit of wonky staging. Still, there’s plenty to like about the rest of this storyline, as both Laurel and her father’s deceptions are exposed, hopefully foreshadowing the far more serious revelations from the Queens in the near future. Of these, Laurel’s misleading of Tommy is rather less serious, and it isn’t so much resolved as it is overridden by Laurel being kidnapped, which is probably for the best. That little subplot mostly just exists to set up the nice scene where Tommy seeks Oliver’s advice about how to deal with Laurel’s relationship with the Hood. Oliver doesn’t give much away in the scene, but his reasonable advice and feigned distaste for the Hood’s vigilantism suggest he’s perfectly happy keeping Laurel at a distance, leaving aside their occasional rooftop meetings. The rekindling of Oliver and Laurel’s romance still seems inevitable, but at least the show is leaving it very much on the back burner. The scene also hints at just how crushed Tommy will likely be if and when he learns Oliver’s secret, as the main reason for his anger at Laurel—basically, he can’t stand the idea of a friend lying to his face—seems to leave Oliver very little wiggle room should Tommy ever learn the truth. This might just be the mechanism that could drive Tommy back toward his father and into villainy, even if it’s just temporarily. Meanwhile, although Detective Lance made his plans clear a couple episodes back, it isn’t until he puts them into action that it becomes clear just how much he has crossed the line. Using his own daughter to get to the Hood is bad enough, but actually placing her in harm’s way—rubber bullets notwithstanding—is a whole other level of extremism. Interestingly, Lance defends himself to Laurel only in terms of doing his job, rather than invoking headier concepts about doing what’s right or following one’s principles. This is potentially a key distinction to make, as it emphasizes Detective Lance’s tendency to look at things in simple, unimaginative terms. Lance’s duty is to the law, and the Hood’s vigilantism violates the law, so he must be bad. He ordered his own daughter to stay away from the Hood, and Laurel willfully disobeys him, and there is no excusing such a betrayal. There’s no room in either of these instances for nuance or subtlety, and Lance somehow manages to be an extremist without displaying any evidence of the lofty ideals necessary to be considered a zealot. He’s done in by his own narrow worldview—not to mention his need to find excuses for his mess of a personal life—and all that ultimately costs him his relationship with his daughter, at least for the time being. As always, the island flashbacks serve as a counterpoint to the main action, and tonight’s scenes feature the introduction of Manu Bennett (best known as Crixus on Spartacus) as Slade Wilson, better known as Deathstroke. This particular version of the character retains the swordsmanship, brutality, and distinctive mask of his comic books counterpart, although this Slade Wilson is an Australian Secret Intelligence Service operative who at least seems like he could be a good guy. After spending most of the episode threatening to kill flashback Oliver—which, based on what we’ve seen of flashback Oliver, is eminently understandable—Wilson instead decides to train him into someone that might help him get off the island, and he asks him to choose a weapon of choice, remarking that he personally likes swords. 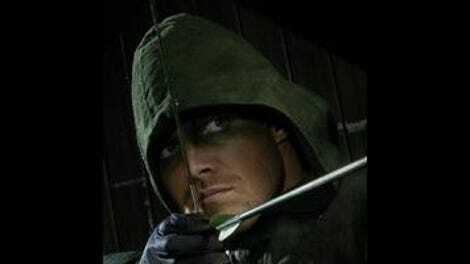 We know that, sooner or later, Oliver is going to make his fateful decision and choose the bow and arrow. Based on the forward momentum seen in “Betrayal,” that choice will hopefully be made sooner, not later. Paul Blackthorne gets in some great acting from the moment he realizes one of his fellow cops sold out his daughter’s safety to Cyrus Vanch. I particularly liked his mounting desperation contrasted with Oliver’s entirely understandable desire to cut ties with Lance. So apparently, Slade Wilson wasn’t the man in the Deathstroke getup who tortured Oliver. The island stuff is getting increasingly convoluted, and while the basic story of Oliver’s journey from idiot youth to trained warrior still makes sense, all of the constant lies, twists, and double-crosses are starting to get a bit hard to follow. Still, this is a small enough part of the show that I’m not overly concerned just yet. 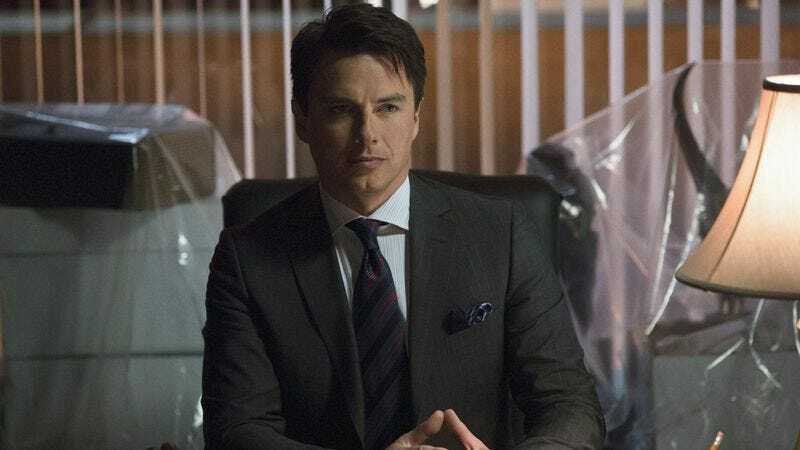 Malcolm’s voice initially seems to be unrecognizable on the recording, although the “Excellent” in the final scene sounds distinctly like an unaltered John Barrowman. A bit of sloppy sound editing, or an indication that Oliver and Diggle will soon suspect Malcolm as well?